Hot action is guaranteed on this 24.28 ft. long course! Become "The spy who overtook me", take the looping "shaken, not served" race cours trial. Always remember your "Goldfinger" by keeping control of your speed regulator. 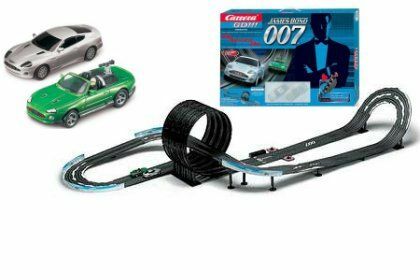 With this set Carrera offers all "James Bond"-fans the opportunity to eclipse the driving abilities of the most famous spy who made film history in "Her Majesty´s Slotracing Service". Now it's time "To live and let slot". The basic set in the 007-design comprises the two detailed original movie-cars Aston Martin Vanquish and the Jaguar XKR..